Some New Yorkers question the government's explanation of what happened on 9/11, a new poll found. LOWER MANHATTAN — A 9/11 conspiracy group that has launched a local TV ad campaign in the runup to the 10th anniversary of the terror attacks released a poll Wednesday finding that some New Yorkers still question whether the government is withholding information about the tragedy. The Siena Research Institute poll, commissioned by the Remember Building 7 campaign, found that 15 percent believe the government tried to hide the truth about 9/11, while another 25 percent believe it only gave "some" of the facts. "As we approach the 10th anniversary of the 9/11 tragedy, it is important to note that there are significant numbers of people who still don’t feel their questions have been fully answered," Manny Badillo, a leader of the Remember Building 7 campaign whose uncle was killed in the attack, said in a statement. "The story of 9/11 is not complete without the voices of patriotic Americans who question the official account of what happened on 9/11. Our world has never been the same since then — it’s time for more information." The poll found that 60 percent of New York City residents said they know enough about the attacks and "it is time to move on," while 36 percent said they had unanswered questions and believe "it is time we get to the bottom of what happened." The Siena Research Institute polled 643 New Yorkers between May 21 and 24, with a margin of error of 3.9 percent. The poll was sponsored by the New York City Coalition for Accountability Now and Architects and Engineers for 9/11 Truth, the groups behind a new 30-second TV spot running on many local TV networks. The ad focuses on the collapse of 7 World Trade Center, the third tower to fall on 9/11. 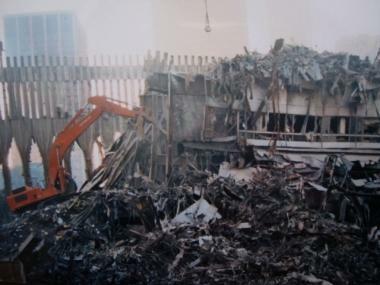 The government concluded that the skyscraper collapsed because of the conflagration at Ground Zero, but conspiracy theorists have argued that the government intentionally demolished it.